Yeah, we’re essentially down to 3 Chakra states now instead of 4. On live, it felt a bit cumbersome to juggle among that many states and trying to decide which one was best to use for any given moment: The Renew or the Heal Chakra? Now that the Renew one has been folded in, I think it will improve the situation. Only times I’ve used Renew Chakras was when I was trying to blanket the raid with HoTs to combat AoE pulses. But then it occurred to me why not use Holy Word: Sanctuary instead when it can cover even more people, use less GCDs, and still do the job of keeping people up? Its a better change, for sure. I think you forgot to mention the significant buff to Chakra:Heal. The crit boost and Renew refresh now applies to all single target healing spells (excluding Binding Heal as far as I could test). Or was that a change of an earlier build? What I forgot to test still, is Holy Word: Sanctuary really on a 40 second cooldown now? Yeah, 28 talented with Tome of Light. Well… I thought that the chakra-renew state was a bit silly considering we only had one hot. I could see the potential for it if we had more hots. 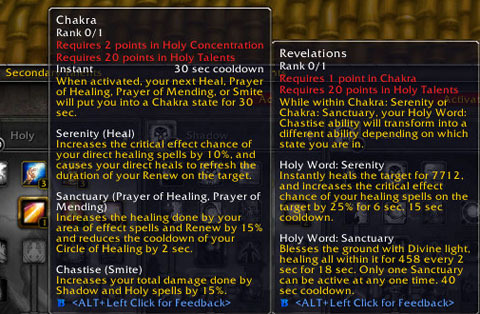 Now it seems as if we have a chakra state for single-target (blasting heals) and a chakra state for raid healing/mobility (sprinkle hots, fill in with an aoe). With the aoe-chakra state buffing pretty much everything except single target, and being extended by the staple POM, I can see myself choosing that state just about all the time except when I’m assigned to tank heal (hopefully never). I did like the chastise-hot thingy (hw: aspire?) and it was JUST added to GridStatusHots. Maybe it will make a reappearance. I wouldn’t mind a 2nd hot, albeit on a long cd. Additionally, from a design perspective Aspire was completely redundant with renew itself- they were both HoTs with a direct heal component, the only differences were duration and distribution. Chakra: Renew?? What is this thing you speak of???? In all seriousness, I think I might have used the combination like twice total in live and beta. I find C:Heal to be a better weapon which renews your Renew on the target. I won’t miss it one bit. I find POH Chakra is overkill on live currently. I tend to sit in Renew Chakra because I find I have fewer mana issues than when I am in POH Chakra (its just hard to find a good time to cast POH in 10 man ICC, even in Hard Modes). However, this is a good change. It makes Chakra a lot less cumbersome of a mechanic. I’ll miss having another HOT, though. It was fun to play resto Druid for awhile, (or it is until the change goes live? Tenses colliding!) leaving a few HOTs on the tank and seeing how long he can go with just those HOTs on him. Guess I’ll just have to finish leveling my Resto Druid now. Chakra PoH seems overpowered right now. I can spam it for the entire length of the fight and never even get close to running OOM. The problem I envision is after Cata is released, the mana usage vs keeping the Chakra state up. 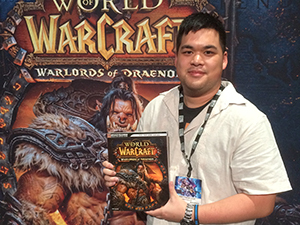 Maybe Matt can give us a little feedback on that since he’s kickin’ the priest in beta. I used Renew…but it did seem redundant to PoH and Sanctuary, so I spent most of my time in PoH. On live, it feels cumbersome to decide between PoH and renew chakras, so I’m glad for the change. It seemed as if Blizz decided to fold in all of our raid healing chakra benefits into one state and our single target healing benefits into another state. Which I appreciate, because actively preventing myself from gaining all the benefits that I have build into my class for my chosen role was never a great feeling when I chose one chakra state over the other. Just a heads up: theyre taking the mana cost off chakra AND lowering the CD to 30 seconds, but leaving the 30 sec uptime. if you time it right (6 is divisible by 30,) you can still push 100% uptime on renew doing the regular Renew spam, just by adding in PoM on coodown if you like. when Chakra falls off, PoM will be up, and its instant cast. Your right back in the zone, without a healing loss. ( quick math tells me you add 20 sec fom Pom on CD during this time. Meaning, on the 4th CD, punch Chakra and fire that PoM for Glorious Mother Outland! No interruption, and no hiccups in HPS! Yep. Totally agree with this being removed… when you hot blanketed the raid, you were raid healing, so why not put it with Chakra: Raid Heal 😉 lol. I used chakra state renew almost all the time. genreally always on cooldown. i recently only just started using mending but always prefer renew. renew was the only spell i ever had to cast if i had a good tank.